Friends, I’m going to take a step back from the LASTing Peace video series–perhaps only for a time, perhaps indefinitely. I will still be writing and posting at least once a week and more often when the Lord leads. I have been worried lately that somehow my husband and I will revert to the “old us.” We’ve changed so much; God has healed and forgiven so much–to go back to a false sense of self-sufficiency–it terrifies me. I cannot live that way again! That puts the onus on me. I can destroy this thing or I can build it up. I know that in the last few days, I have been kind of sulky and subversively unhappy about things: his long hours at work, his fatigue or distance at home … you know that, “It’s not fair” kind of thing. I know even in the midst of my poor attitude that I risk pushing my husband away by making him feel like he’s needed but failing to be available. So then I fret that I’m going to ruin this thing—probably already have. What if, by my attitude, I’ve already shut him down. What if he’s already decided that I’m whiny, obnoxious, unnecessary and a burden? What if I’ve lost my chance to build us? And then fear grips me again. God, what if you started all this and now I’ve messed it up and you’ve given up and you’re just going to let us slide all the way back down into our mud. What if God!? What if you don’t care enough? What if I can’t trust you enough to keep us, save us, bind us, grow us? (Ever ask those questions? God’s faithfulness is found in His word. There are answers to every hurt, every question, every longing. We need only be still enough to listen and willing to hear what we sometimes don’t want to hear–and finally, willing to agree that His way is always the best way. How are you feeling as you merge back into life after the hectic holidays? As wonderful as fellowship with family and friends can be, it often includes sharing close quarters with at least one person who seems to bring out the worst in us. Along with hallowed hymns and scrumptious side dishes, we find a healthy serving of tension and stifle the grumblings of bitterness. How do we deal with these feelings? How do we overcome the unwelcome irritation? The Biblical character, Abigail, gives us an example of the godly, effective way to deal with these relationships. I Samuel 25, tells us that Abigail was married to a harsh and selfish man named Nabal. When Nabal’s foolish behavior got their whole household into trouble, Abigail’s response was not accuse him or retaliate against him. Instead, she sought his good! Abigail set out to preserve and protect her household. The godly response when faced with negative, frustrating people is to seek their good. “Let no one seek his own good, but the good of his neighbor,” 1 Corinthians 10:24. Jesus tells us to pray for our enemies and do good to those who hate us. Bitterness, arguments and defensiveness do not produce the righteous life that God desires. However, when see turn the other cheek and act in kindness toward those who hurt us, God will honor us and receive the glory. Keep your eyes open for my upcoming Bible study, Beyond Belief, due on June 2, 2015. Considering Male Body Hatred-Do Men Get Eating Disorders? Here at Predatory Lies, we talk a lot about female body image, eating disorders, body dismorphia, cultural lies and pressure from the media. But I’ve never taken a close look at how this social frenzy for physical perfection affects men. Personally, I don’t feel equipped to address that. However, this article is exquisite and in many ways could have been written about women as well. This is just the teaser. I highly recommend you click through and read the whole article. We compare ourselves to others in the gym. We come away from movies wanting to exercise for eight hours. We would rather jump in front of a truck than take our shirts off at the pool. We feel pathetic and small. We look at ourselves in almost every mirror we pass. When alone, we flex — not because we like what we see, but because we don’t. We have spent hundreds of dollars on pre-workout, weight loss, and weight gain supplements. We research the best way to bulk, shred, diet, and binge. To finish reading, click here! How many magazines do you have on your bedside table? How many in your backpack? Okay, once you’ve done that homework, I need you to do a bit more investigation. Look at the covers. How many headlines promise to make you more beautiful? How about more popular? I bet at least two of them mention a “get-fit” plan or promise to tell you a little secret about which foods are good and bad for you. One the surface, there’s nothing wrong with these magazines. The quizzes can be fun to take with a friend. And I’m the first to admit I’ve discovered some cute ways to style my hair. But underneath the glitter and glossy pages, did you know that your magazines are telling you little white lies? Studies say that more than half of 13-year-old girls in the United States don’t like their bodies. And most admit that they get their ideas about health, fashion and what they should look like from magazines. The pictures of celebrities tell them what they should wear, what will make boys like them and how their bodies should look. But it’s scary what can happen to a girl when she chooses to believe these little lies about her appearance and her value. When I was fourteen-years-old I began a long battle with anorexia. Never heard of it? Anorexia Nervosa is an eating disorder. Someone with anorexia stops eating or severely limits what they eat. They might start to exercise too much and to other things to lose weight. And even when they lose too much weight and are dangerously skinny, they still believe they are too fat. 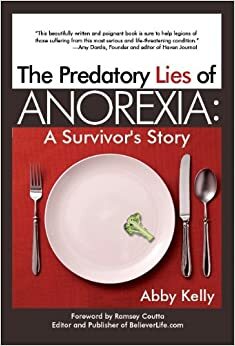 My battle with anorexia lasted more than 14 years. During that time, I lost a lot of friends who worried about me and didn’t know how to help me. My little sisters were scared that I was going to die. My parents cried and worried all the time because actually being too thin is even more dangerous than being a little too heavy. My hair started to fall out. I grew lots of little-bitty, soft hairs all over my body. Because I didn’t have any body fat, my body was trying to stay warm. I cried a lot. When your mind doesn’t get enough nutrition, it doesn’t think clearly and many girls with anorexia get depressed, too. I fell asleep in school because my body didn’t have enough energy from food to stay awake. I even passed out a couple times, but I don’t remember it. My family took really good care of me. When they understood how sick I was, they sent me to a hospital for eating disorders in Arizona. I spent three months there, away from my family and friends. I missed school and church; I even spent my 16th birthday at the hospital. Sometimes, I was so tired and scared and sad that I even wanted to die. Getting well from anorexia often takes a really long time. It was hard for me to try to gain weight. I was scared that I might get too fat. In fact, even after I got well, I started to worry so much about being fat that I got sick again and had to return to the hospital when I was eighteen. Jesus is the one who saved my life. Knowing how much He loves me is what gave me the courage to keep trying to get well and helped me make it through the loneliness when I was in the hospital. I read the Bible, not magazines, and learned what Jesus says about my beautiful body that He created. In Genesis, God tells us that He made us in His own image. How can we not be perfectly wonderful if God made us to look like Him? In Psalm 139, David writes that our bodies are marvelously made. And, 1 Corinthians 6:19-20 reminds us that our bodies are the temple of the Holy Spirit. We belong to Him! We need to take care of out bodies the way God wants us to and not worry about the world’s ideas of perfect. This article was first published in ‘Tween Girls and God.